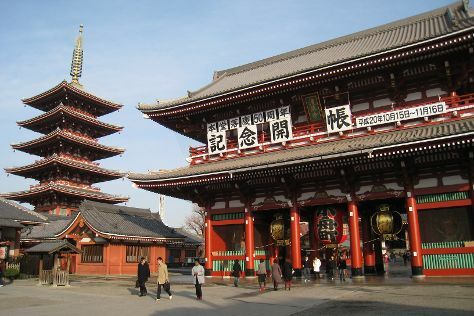 Sensō-ji and Imperial Palace are good opportunities to explore the local culture. You'll explore and learn at Tokyo National Museum and Edo-Tokyo Museum. And it doesn't end there: wander the streets of Odaiba, take in the spiritual surroundings of Asakusa Shrine, admire the striking features of Tokyo Tower, and contemplate the long history of Yasukuni Shrine. To find other places to visit, traveler tips, maps, and more tourist information, refer to the Tokyo tour builder . Melbourne, Australia to Tokyo is an approximately 14.5-hour flight. You can also do a combination of train and flight. Due to the time zone difference, you'll gain 1 hour traveling from Melbourne to Tokyo. Expect colder weather when traveling from Melbourne in March: highs in Tokyo hover around 17°C, while lows dip to 7°C. Wrap up your sightseeing on the 26th (Tue) to allow time to travel to Kyoto. Get a sense of the local culture at Nijo Castle and Kinkaku-ji. Get some historical perspective at Kiyomizu-dera Temple and Fushimi Inari-taisha Shrine. There's still lots to do: take in the spiritual surroundings of Sanjusangendo Temple, get the lay of the land with Walking tours, and don't miss a visit to Gion. To find ratings, photos, maps, and tourist information, refer to the Kyoto online trip builder . Traveling by train from Tokyo to Kyoto takes 3 hours. Alternatively, you can fly; or drive. In March, daily temperatures in Kyoto can reach 16°C, while at night they dip to 5°C. Cap off your sightseeing on the 29th (Fri) early enough to go by car to Nachikatsura-cho. 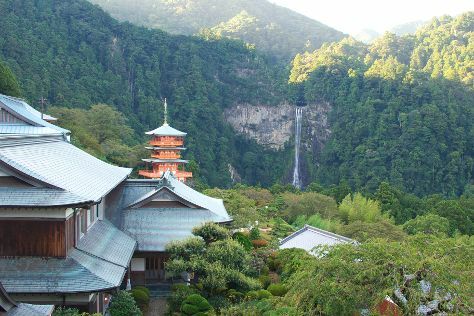 On the 30th (Sat), admire the sheer force of Nachi Mitaki Falls, then take in the spiritual surroundings of Seigantoji Temple, then take in the spiritual surroundings of Kumano Nachi Taisha, and finally contemplate in the serene atmosphere at Kumano Hayatama Taisha. Get ready for a full day of sightseeing on the 31st (Sun): take in the dramatic natural features at Ichimai-iwa, then explore the striking landscape at Hashigui Rock, then contemplate in the serene atmosphere at Kamikura Shrine, and finally make a trip to Daimonzaka. For photos, more things to do, maps, and more tourist information, read Nachikatsura-cho trip itinerary app . Drive from Kyoto to Nachikatsura-cho in 3 hours. Alternatively, you can take a train; or do a combination of bus and car. Traveling from Kyoto in March, Nachikatsura-cho is somewhat warmer at night with lows of 11°C. Wrap up your sightseeing on the 31st (Sun) early enough to drive to Matsue. Visit Yaegaki Shrine and Karakama Shrine for their historical value. You'll explore the less-touristy side of things at Adachi Museum of Art and Izumo Hinomisaki Lighthouse. Change things up with these side-trips from Matsue: Izumo (Former Taisha Station, Kojindani Ruin, & more). There's still lots to do: take in the spiritual surroundings of Tamatsukuriyu Shrine, make a trip to Matsue Castle, and explore the world behind art at Shimane Art Museum. To see more things to do, where to stay, reviews, and other tourist information, refer to the Matsue online route maker . You can drive from Nachikatsura-cho to Matsue in 6 hours. Alternatively, you can do a combination of train, flight, and taxi; or take a train. Expect slightly colder evenings in Matsue when traveling from Nachikatsura-cho in April, with lows around 11°C. Cap off your sightseeing on the 3rd (Wed) early enough to go by car to Hiroshima. Hiroshima Peace Memorial Museum and Yamato Museum will appeal to museum buffs. Itsukushima Shrine and Hiroshima Peace Memorial Park are good opportunities to explore the local culture. Explore the numerous day-trip ideas around Hiroshima: JMSDF Kure Museum (in Kure) and Hatsukaichi (Daishoin Temple, Miyajima, & more). There's more to do: get engrossed in the history at Hiroshima National Peace Memorial Hall for the Atomic Bomb Victims and see the interesting displays at Honkawa Peace Museum. Make your Hiroshima itinerary with Inspirock to find out what to see and where to go. You can drive from Matsue to Hiroshima in 2 hours. Alternatively, you can take a bus; or take a train. In April, plan for daily highs up to 22°C, and evening lows to 13°C. 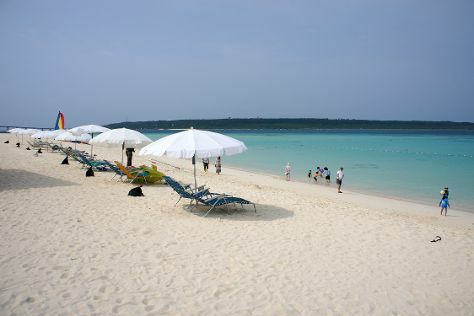 Wrap up your sightseeing on the 6th (Sat) early enough to travel to Ishigaki. You'll explore the less-touristy side of things at Cape Hirakubozaki and Kondoi Beach. Get in touch with nature at Yonehara Beach and Stand-Up Paddleboarding. There's much more to do: paddle through the water with a kayaking and canoeing tour, take in panoramic vistas at Maesedake Observation Site, stroll around Banna Park, and take your sightseeing to a higher altitude at Nosoko Mape. For more things to do, ratings, other places to visit, and other tourist information, go to the Ishigaki visit planner. Traveling by combination of train and flight from Hiroshima to Ishigaki takes 5.5 hours. Alternatively, you can fly. Traveling from Hiroshima in April, expect Ishigaki to be somewhat warmer, temps between 30°C and 24°C. Wrap up your sightseeing on the 9th (Tue) to allow time to ride a ferry to Iriomote-jima. Eschew the tourist crowds and head to Canyoning & Rappelling Tours and Pinaisara Falls. Take a break from the city and head to Iriomote Island and Scuba & Snorkeling. There's still lots to do: add some adventure to your tour with a kayaking and canoeing tour, admire the sheer force of Mizuochi Falls, and look for all kinds of wild species at Funauki Village. Before you visit Iriomote-jima, use our trip planner to discover what you can do and see there. Ride a ferry from Ishigaki to Iriomote-jima in an hour. 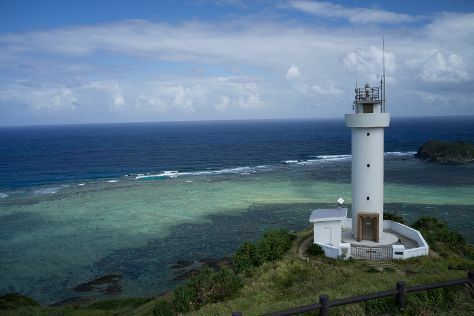 April in Iriomote-jima sees daily highs of 30°C and lows of 24°C at night. Cap off your sightseeing on the 12th (Fri) early enough to catch the ferry to Miyakojima. Visiting Yonaha Maehama Beach and Aragusuku Beach will get you outdoors. Eschew the tourist crowds and head to Sunayama Beach and Scuba & Snorkeling. And it doesn't end there: take in the views from Irabu Bridge, kick back and relax at Toguchi no Hama, make a trip to Boraga Limestone Cave, and identify plant and animal life at Yabiji. To see reviews, where to stay, maps, and other tourist information, refer to the Miyakojima road trip planning app . You can ride a ferry from Iriomote-jima to Miyakojima in 4 hours. Expect a daytime high around 29°C in April, and nighttime lows around 23°C. Finish up your sightseeing early on the 15th (Mon) so you can travel to Onna-son. Nakijin Castle Ruins and Shurijo Castle will appeal to history buffs. 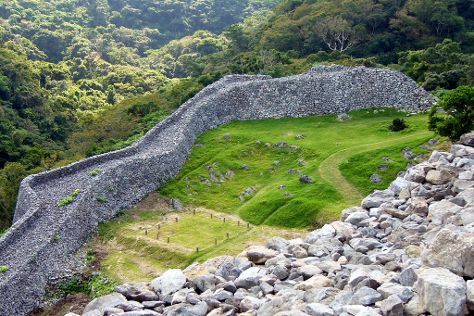 Get some cultural insight at Sefa-Utaki and Katsuren Castle Ruins. Venture out of the city with trips to Zakimi Castle Ruins (in Yomitan-son), Okinawa Prefectural Archives (in Haebaru-cho) and Okinawa Peace Memorial Park (in Itoman). There's much more to do: head outdoors with Outdoor Activities, explore the striking landscape at Tobera Rock, step off the mainland to explore Kouri-jima Island, and meet the residents at Okichan Theater. To see photos, where to stay, other places to visit, and more tourist information, you can read our Onna-son trip planner . Traveling by combination of flight and bus from Miyakojima to Onna-son takes 3.5 hours. Traveling from Miyakojima in April, Onna-son is slightly colder at night with lows of 20°C. Finish up your sightseeing early on the 18th (Thu) so you can travel back home.